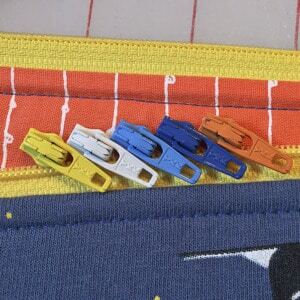 Lazies, It’s time to choose a fabulous and functional accessory for our newly finished Miranda Day Bag. One technique in our last post on this project had us squinting. Today’s technique is an eye-opener. Shown here is a close-up of some ready-made handle options and our Miranda which is made up in Sketchbook fabrics by Yolanda Fundora. The colors match better than is shown in the picture. They coordinate well enough to work with this design. 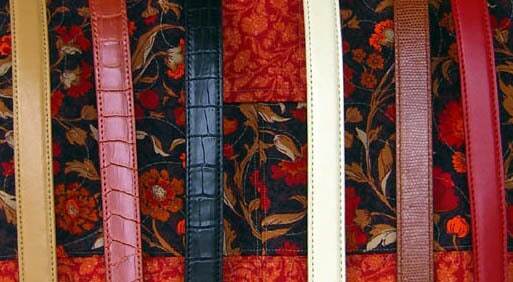 All six shoulder strap options are from the Exclusively You product line by Leisure Arts. You might remember that I fell in love with these products while writing my Bold Bags book for Leisure Arts. We have six viable options. Different colors, some different textures. But how to choose? I posted a couple of pics at Facebook and asked for feedback. Facebook Lazies – thank you for your votes and comments! So, it’s back to our auditioning techniques. I gathered everything up and I hung it all on the front door out of direct sunlight. My neighbors must think I’m crazy. I took a few pictures, stared at things on the door for a bit, took a break, I’m sure coffee was involved, but I still couldn’t decide. I needed help. The wild-card auditioning technique for today is the addition of the camera. We’ve used it before, but today it was the decision maker for me. The camera sees things differently than I do and I need to pay attention to what it tells me. Tan – it’s okay, perhaps a bit boring for the style of these fabrics. Orange – matches beautifully with the orange tones (trust me on this one). Black – beautifully supports the dark feature fabric and is a safe, classic choice. Copper – blends right in to the medium warm tones of the feature fabric. Red – matches our reds beautifully. Well, all things are not equal. Before I took a picture of the conglomeration hanging on my front door, all I saw was color. Which color do I want on this bag? In looking at the photo, I saw something else. The camera brought my attention to the fact that I’m introducing a new material. These are not fabric handles. They bring a new character, or design element, to our project. Take another look and notice the materials used in these handles. The black and orange faux croc handles now seem more like something you’d see on a leather bag. And the copper faux snake suddenly seems rather briefcase-y or such. Now, in looking at the smooth handles one more time, I notice that the topstitching on the long edges and the slightly poofy center seems rather quilty in character. I never thought about it before, but the design of the smooth handle fits the style of our quilted bag more closely than the others. A close match in style and color supports and compliments the bag rather than competing with it. Several of these handles would be a fine pairing with our project. But given this new insight regarding the character of these materials, the red handle jumps out as the clear winner in my humble opinion. The black faux croc handle is my second choice. Despite its surface texture, it would have brought the color black to a second area of the project, offering visual comfort by repeating the color. Here’s Miranda with her newly attached accessory. A shoulder strap is easy to add to any open-top tote like Miranda. Don’t hesitate to listen to the results of your auditioning techniques as well as looking at them. And if one technique doesn’t answer your question, go back to your toolbox of techniques and pull out another one. While it might seem like you are adding more variables to consider, you might actually be narrowing your choices more easily. I was only looking at color before the camera pointed out that I should consider the material as well. I think you made the RIGHT choice….the leather really brings the bag to a new level…..fantastic look! 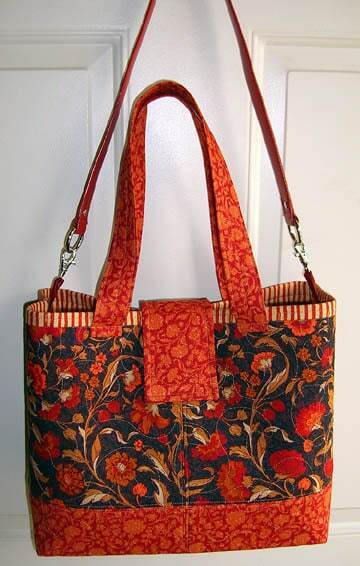 after looking at all handles the fabric one does the trick for me but if I had to have a faux handle them the RED. I have yet to add another long handle to my Mirandas, however I am making another trip soon and think this will be just the touch on a chili pepper one I am making! Love the red one but I was going for the snake up until you mentioned the texture! LOL Thanks for sharing. I’m a little confused. Do you have both straps on the same bag? Do you tuck the fabric straps inside if you are using the leather strap? I like a set of handles and a shoulder strap for my Miranda Day Bag. The shoulder strap is just a nice option to have when you want to sling the bag over your shoulder. 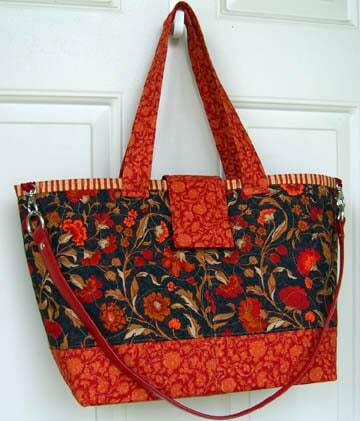 I leave the fabric handles hang by the side of the bag when I use the shoulder strap. And I was sold on the orange – right until you noted the top stitching on the red strap: perfect compliment! I freq use my camera to see things I don’t. When looking at the picture, it seems to say something different all the time. So when I can’t make a decision on my own, I always use the camera. I like the copper one. Where can you purchase these handles to put on open bags? I love those handles!!! I could see being able to use them over on different bags too. Great idea. THANK U JOAN, WOMENS DAY IS COMING UP IN JULY, 2009 AT MY CHURCH, AND I AM GOING OUT TO BUYE SOME BLACK AND WHITE FABRIC AND GET BUSY AND ADD ON THE BLACK BELT OR THE WHITE BELT OR BOTH. HOW DO THAT SOUND 2 U , COOL I HOPE. KEEP UP THE GOOD WORK AND GOD BLESS U AND YOUR STAFF. I’m a “PINK” person & “RED” comes next & I just love the red that you have picked out. 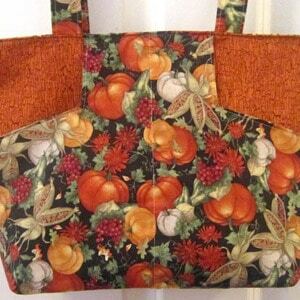 I have a purse fettish & am always looking for bags to sew up. I have this new pattern & only takes 25 min. to do. You use 2 different colors, stabilizer, a snap & either fabric made handle or web handle. If you really want to have fun with the color go to the upolstery dept & pick out some thing WILD there for the summer. I love what you have done with your LAZY ANGLER ruler & it’s a blast using it. 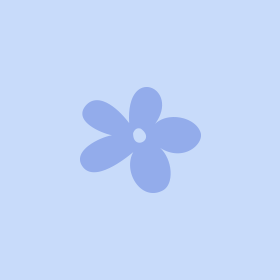 Watching your videos on Kaye Wood site is fantastic , keep up the great work you do for your viewers. Hi Joan – goodness how I love your wondrous ideas and patterns – but please tell me where I can buy the handles – probably only available in the US and not Downunder!! Your Perfect Pouches have been such a hit and I’m making them for all my guests at an upcoming fundraiser for Breast Cancer – The Biggest Morning Tea – not sure if you do the same over there – but thousands of people hold a fund raising Morning Tea in May and raise money for Breast Cancer Research etc. Keep on keeping on Joan!! 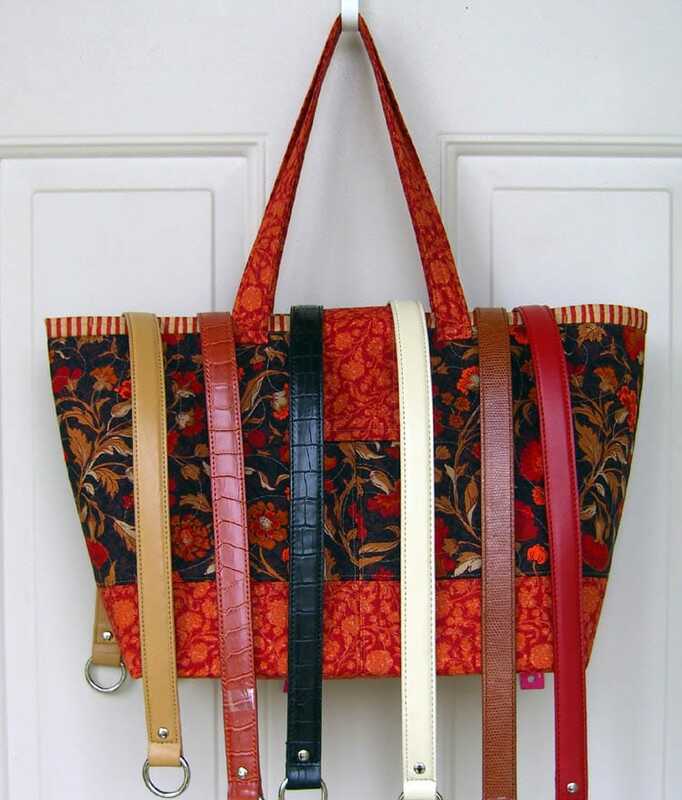 Thanks Joan I learn so much from you.What do you think of making a Miranda bag with only the long handles. I am a plus size on oxygen, and using regular handles is difficult.Right now I am making a Gracie bag and i am going to try long handles. Thanks again Ellen. Red was my choice! I hadn’t thought about the texture, but you’re right. I love a shoulder bag, so I put long straps on mine. My daughter has borrowed it for a trip and feel in love with it and wants one in a different color. My daughter in law is expecting our first grandbaby and she thinks it will make a great diaper bag. My daughter also wants one with a zipper added to the bottom for a cooler for snacks for those hot summer days. She thinks I can work miracles. Any idea how to accomplish that? Ok, I know I am going to be the odd woman out here. I might be missing the point of these two straps. It looks like the straps are both long enough to be shoulder straps….at least from what I see in the picture. So why two?? I like the color choice of the leather strap. I would do the same thing but on a bag that had shorter fabric straps. That way you had the option to either carry the bag in your hand, or on you shoulder. I have not made the Miranda bag..yet, but will very soon. help make choices. I’ll try it. Love your patterns and great ideas.